Photo by Ilnur Kalimullin on Unsplash … Came up when I searched for ‘hexagon’. But surely more sides is better, so we’ll let it pass. Only no-one on the internet seems to have implemented a microservice with that particular combination of structure and technology before. Or at least, no-one has talked about it. Each individual thing I mentioned, yes, there is some information available — but putting the pieces together was a challenge. Kotlin: Because Kotlin is awesome. Everyone says so. Ktor: Because if you need a framework on top of a framework in order to simplify your framework, something has probably gone wrong somewhere. Ports and Adapters: P&A, also known as ‘hexagonal architecture’, is an incredibly powerful mental tool for producing testable, clean architecture. I struggled for a long time to articulate why I found it so much more powerful than an ‘n-tiered architecture with DI’. I think it boils down to cementing the concept of ‘inside’ vs. ‘outside’. Business logic and the domain model goes ‘inside’. Everything else is outside. I have no doubt with sufficient discipline you can accomplish the same thing with other architectural styles. But applying P&A gives you some strong conventions to help guide your thoughts. Gradle: Curiosity, mostly. I’ve used Maven extensively in the past and made my peace with it. But I’ve heard good things about Gradle and I was curious to use it ‘in anger’, as it were. The Gradle Kotlin DSL: Because Groovy and I have parted ways. Also, curiosity. Also, masochism. Multi-modules: Ahah. Well, now… I find the reaction to adding modules to a project, especially a relatively trivial microservice, quite mixed. Everything from, “It’s fine — the structure helps”, to “GET YOUR FILTHY STINKING MODULES AWAY FROM MY CODE.” (Well, the actual words were ‘What? No!’ — but my super-power is hearing what isn’t said.) It’s a surprisingly divisive issue! 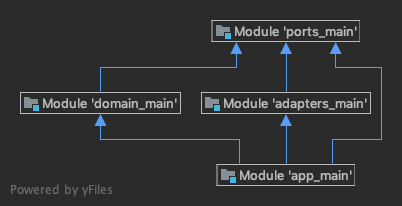 The reason I choose multi-modules is to manage dependencies. It helps keep you honest, helps you enforce your own rules. For example, ‘Domain shouldn’t know anything about JSON because it’s a transport layer concern’ or ‘Controller can’t talk directly to the database’. Sure, it adds some complexity and might feel unjustified for a small service. But if you’re producing multiple services you only take that complexity hit once — then you have a simple template to follow for all the rest. And, be honest, how often do your ‘micro’ services actually stay micro? Guice: Because it’s not Spring, we’re used to using Guice with Play, and there was some assistance on the ktor website. Let’s do a quick walk-through of the different modules though, their dependencies and any challenges involved setting them up. However — if you feel compelled to write a true end-to-end integration test against a real running service — this is the module to do it in. Hexagonal Architecture with Kotlin, Ktor and Guice was originally published in Hacker Noon on Medium, where people are continuing the conversation by highlighting and responding to this story.